1. 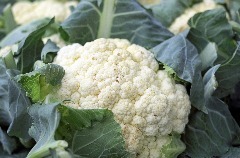 ​Boil cauliflower in water to cover until tender; break into florets and place in a casserole dish. 2. Mix mustard, salt and mayonnaise; spread evenly over cauliflower. 3. Top with cheese and bake at 325º until cheese is melted; sprinkle with paprika.